An interesting and well-produced conversion of a graceful Cold War prototype. The P.1109B was a radar equipped development of the Hawker Hunter F.Mk 6. This particular airframe was used for live firing of Firestreaks on the Llanbedr range in 1957. A number of other airframes flew with the same nose modifications under designation P1109A, but without Firestreaks being carried. 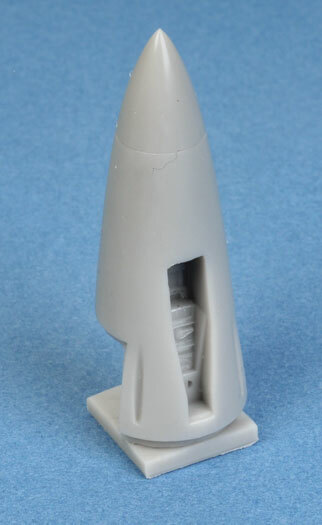 Freightdog continues its commitment to Cold War prototypes with this new P.1109B, designed for use with Revell's excellent 1/72 scale Hawker Hunter Mk.VI kit. The conversion comprises nine parts in grey coloured resin. The centrepiece is the aerodynamic nose that housed the AI.20 radar scanner. This is cast cleverly in one piece, even including deep detail in the nose wheel bay. Cleanup should not be too much of a chore thanks to the relatively thin casting strips. A few minutes with a razor saw followed by some sanding stick therapy should see the new nose ready for use. 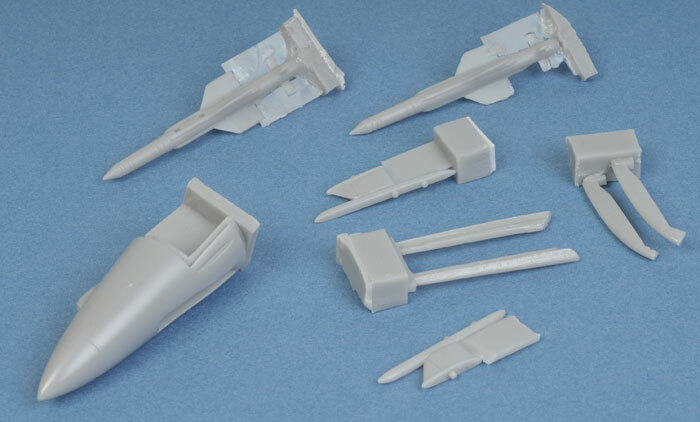 Two DH Firestreak missiles and pylons, and F.Mk 4 straight (pre-Mod 228) wing leading edges are also included. All parts are perfectly cast, with no imperfections visible on my sample. Markings for XF378 are included on the small decal sheet. These are designed to be used with Revell's kit decals. My early sample did not include instructions, but installation looks to be quite simple. One cut along the kit nose should take care of the biggest part of the conversion.